CodeTwo Exchange Migration and CodeTwo Office 365 Migration – introducing Jobs and new UI – Versions 2.0 out now! With the newest versions 2.0 of CodeTwo migration software we have much more to expect as both products have undergone major improvements. Now we can experience better management of performed migrations which are now displayed as Jobs and it is all set in a new UI. CodeTwo Exchange Migration and CodeTwo Office 365 Migration will prove more invaluable than before in performing your migrations from Exchange 2007 to Exchange 2016 or from on-premises Exchange servers to Office 365 organizations. Simply speaking, it is a new perspective on your planned operations. We have developed this feature to completely reorganize and redesign management of your migrations what have already proved to be a huge step forward. Why? This new feature includes the possibility to create migrations as Jobs which hold all necessary settings for current operations. It is a perfect solution for migration scenarios in which operations in previous versions of the software were rather tiresome to set. Now let’s assume that you want to migrate mailbox data from an old source server to different target servers by just simply dividing the data. You can do it by creating multiple Jobs and adding selected Active Directory groups or individual users to a chosen migration job dedicated to each different target site. This way Jobs give you greater insight where particular users’ data is headed to. The same way you may plan to move mailbox data from the last 30 days first, and then the rest of it. Again, it can be done in batches by just simply creating a separate Job for each of the two stages what will result in full control of both steps of the migration. These are just a few scenarios out of many in which you may successfully use Jobs in your migration operations. Remember that each Job can be automatically launched at a selected period of time using Scheduler available during Job configuration process. You may revise settings for a created Job any time you like. We have optimized the code of both programs what resulted in greater migration speed and allowed for setting up a higher number of concurrent mailboxes during the process. Adding new alert windows Good news and Bad news will bring more clarity by providing necessary information on on-going processes and will enable to send email reports keeping you informed on the progress. There have also been minor improvements to the search mechanism. 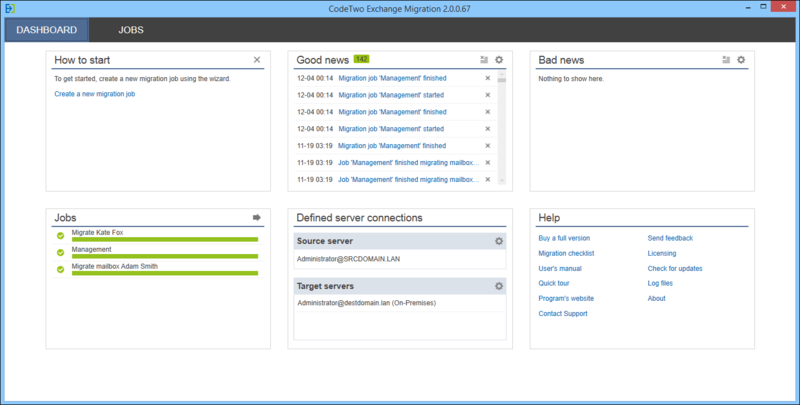 Test CodeTwo Exchange Migration 2.0 or CodeTwo Office 365 Migration 2.0 now! For detailed information on licenses or to learn how to upgrade your current version of the software, please visit the dedicated site in user’s manual. 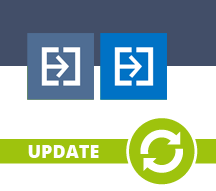 For a full list of changes, please visit the version history site for CodeTwo Exchange Migration or CodeTwo Office 365 Migration.